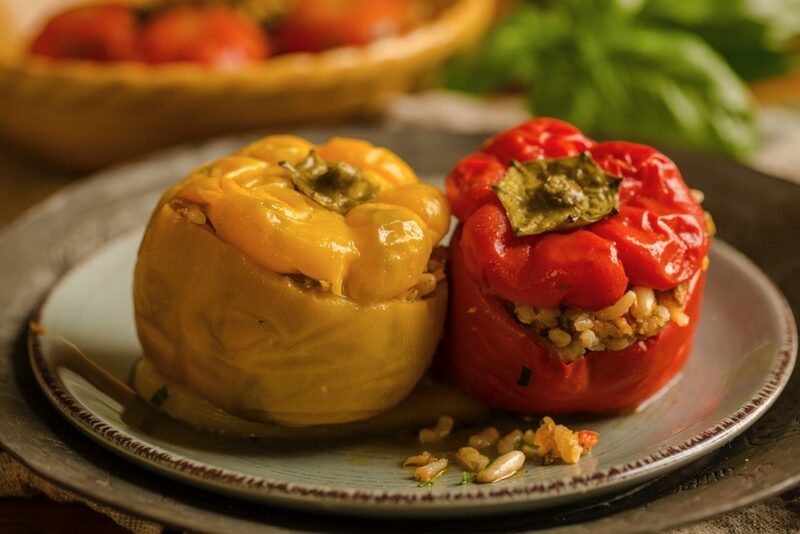 Close your eyes and take one bite of these stuffed vegetables; the sweet tinge of peppers, the distinctive flavour of pine nuts, the aroma of mint, the taste of olive oil immediately transport you to sun, sea and blue skies. Slow-cooked in the oven this dish turns the vegetables into a tender confit. You can eat it warm and enjoy it at room temperature the next day. Slice the tops of the peppers and tomatoes and set aside. Hollow the vegetables with a spoon, reserving the fleshy bits of the tomatoes. Sauté the onions with 1 teaspoon sugar and some salt in oil for at least ten minutes until they are soft and just begin to caramelise. Add the grated courgette and cook for another 3 to 4. 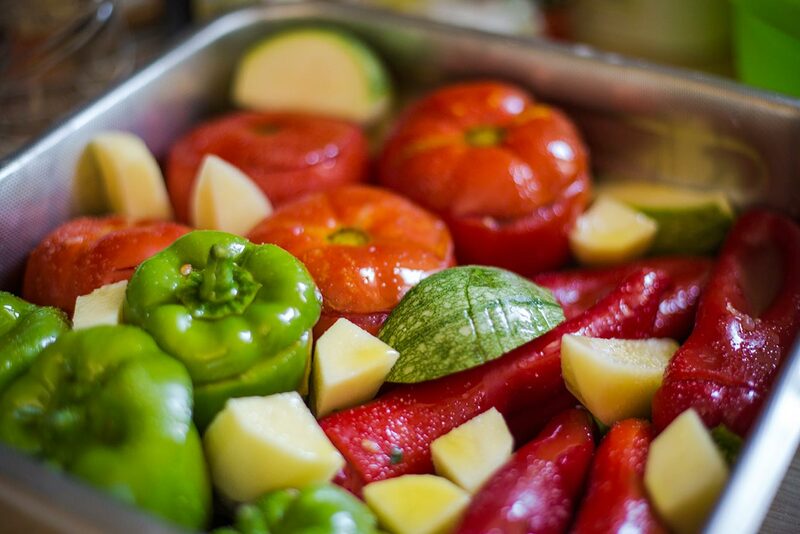 Grate or chop the tomato bits and incorporate them to the onion mixture; cook for a further 2 minutes. Remove from the heat. Combine with the rice, herbs, raisins and pine nuts. Season with spices and salt and finally mix in the chopped herbs. Taste the mixture and adjust the seasoning. Fill each of the hollowed vegetables 2/3 rd. up leaving space for the rice to expand. Drizzle liberal amounts of olive oil, cover with a lid or with foil and bake at 180C for 1 and ½ hours. Uncover, sprinkle grated pecorino mixed with breadcrumbs and bake for another 20 minutes. Serve warm or at room temperature.